The softball team hosted the Circle Thunderbirds on Monday evening. To start the first game off, Sydney Adler took the mound. 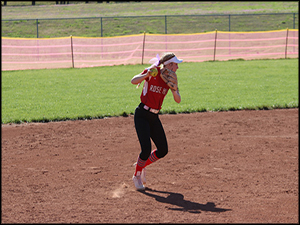 As they made their way through the innings and into the 7th, the score was 6-2 Rose Hill. Circle made an attempt at a comeback but came up short making the final score 6-5. The second game was a different story. The team made a change in the pitcher position and went with Izy Cain. The Rockets held them to zero runs in the last four innings. The game ended in a score of 10-3. Their next matchup will be in Wellington on Thursday, April 11. 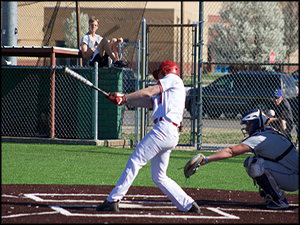 The Rocket baseball team had a hard night of competition on Monday evening. They faced off with the Thunderbirds for a double header. Trevor Kiser took the mound in the first game. The scoring went back and fourth, even though the Rockets outhit them 14-12. Once again, the Rocket defense was a problem as they committed 8 errors giving the Thunderbirds several unearned runs. The game ended in a score of 13-10 with Circle taking the win. As the second game rolled around, Brett Brenzikofer started on the mound. This game was also back and forth with the teams tied multiple times. The game was tied 5-5 going into the 7th inning but Circle was able to put some hits together and score two runs to take a 7-5 lead, which was then the final score when the Rockets could not put together a rally in the bottom of the inning. It was a good battle throughout both games. The Rockets next matchup will be on Monday, April 15 at Winfield.